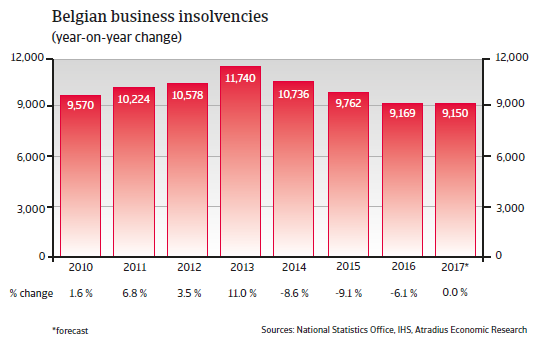 Belgian corporate insolvencies recorded yearly decreases in the years 2014-2016 after major increases in the wake of the 2008 credit crisis. In 2017 business failures are expected to decline only 2% after a 6% decrease in 2016. Construction and retail insolvencies are bucking the positive trend since H2 of 2016. With about 9,150 cases forecast this year, the number of insolvencies will still be higher than the levels seen before the start of the global credit crisis in 2008 (about 7,700 cases in 2007). 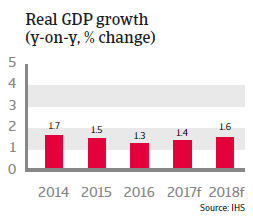 Belgian economic growth decelerated to 1.3% in 2016, as private consumption was negatively affected by increases in indirect taxes and a temporary suspension of wage indexation imposed by the government in 2015. Economic growth is expected to remain modest in 2017 (up 1.4%), with household spending expected to remain restrained by on-going fiscal consolidation and wage restraining measures. That said, unemployment is expected to decrease further in 2017. 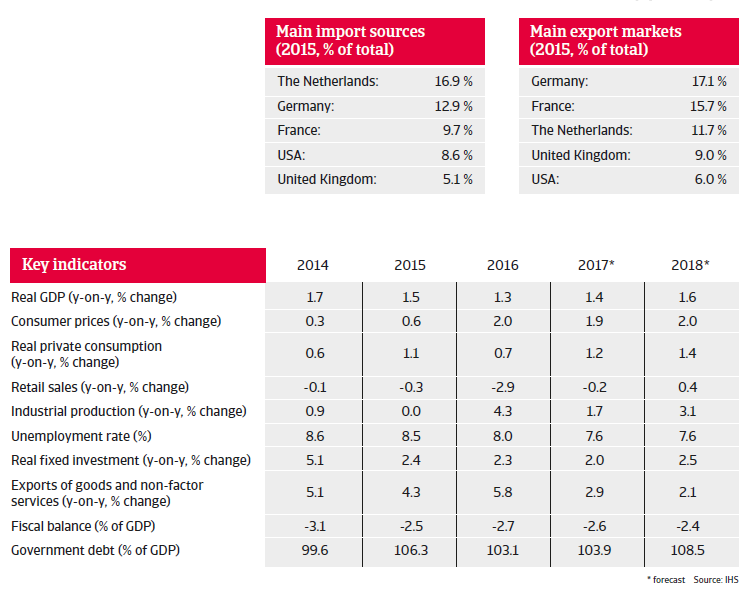 Net exports should contribute positively to Belgium’s economic performance. As Belgium is an export-driven economy, its balance of trade should be structurally positive. The progress in structural labour market and pension reforms is starting to bear fruit, and should help to increase the resilience and international competiveness of the Belgian economy in the mid- and long-term. A modest decrease in the yearly fiscal deficit is expected in 2017, supported by on-going austerity measures. Pension reform has significantly improved the long-term sustainability of public finances. 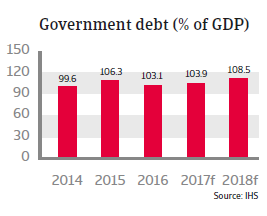 However, public debt will remain one of the highest in the European Union in terms of the government debt-to-GDP ratio. 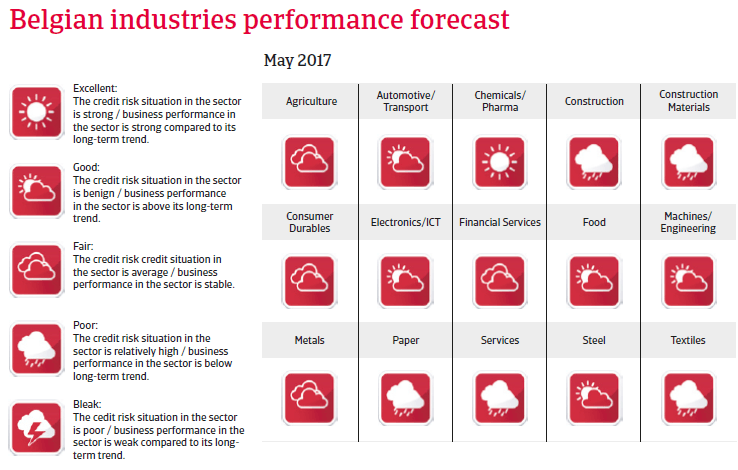 Despite decreases the level of payment delays and insolvencies will remain high in 2017 as a full-scale rebound is not expected for the time being.